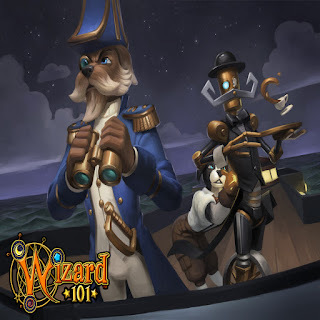 Paige's Page: Test Realm Teaser - Wizard101 Coming Soon. Test Realm Teaser - Wizard101 Coming Soon. Test Realm is coming soon! I wonder where that boat is headed. Not sure if that robot needs fixing? Celestia? So what I can tell there are many worlds we will be traveling. Wonder what for? Could have something to do with the expedition to Celestia, since those two character models are first introduced in that world.